For my recent trip to Kobe, Japan, I opted to stay at the brand new Yume Nomad Guesthouse in Shinkaichi. The hidden on-a-hillside little guesthouse was barely a year old and already it was a popular choice for foreign tourist, my group of four included. I booked a room for four about seven months ago on account that I was traveling there at peak period and got a quick reply from cafe manager, Bunn, confirming my booking. Location-wise, Yume Nomad is three stops away from the main transportation, entertainment and shopping hub of Kobe which was Sannomiya. To get to the guesthouse by train, there are two train lines you can take which are the Seishin-Yamate subway line or the Hankyu line where you get off at Minatogawakoen station or Shinkaichi station respectively. I prefer taking the Seishin-Yamate line as the stop is closest to the guesthouse. I just needed to exit through east exit no 5 and Yume Nomad is just 3 minutes right down the street and the flight of stairs that leads up the guesthouse and cafe is easily noticeable from the road. Like most in Japan, check-in for this guesthouse was at 3pm and we were allowed to leave our luggages in their storeroom before we wandered about Kobe for the better part of the day. When we came back, we were shown to our room (Room 102) and the owner gave us a quick tour of the guesthouse. We were lucky to get a room on the ground floor as it was close to the kitchen and the living space which also doubled as the cafe space for guests. The only downside was that my room was right next to the cafe and we could hear a kid shrieking and yelling away through the wall. Thankfully, that was a lone incident. My room came with two bunk beds, an toilet and a bathroom. The toilet and bathroom space were separated and had hot water which was a blessing on cold spring days. The room was a little dim but each bed had their own night lamps. Bed and pillow sheets were given to us to put them on ourselves, a common practice in hostels and guesthouses. The bed was very comfortable to sleep in and the comforter, so fluffy and thick I could have just rolled up in it and not moved. My only gripe was the light on the wall that I kept knocking into because it was right next to my top bunk bed. That and the bunk bed ladder steps which were a pain to my soles. We were told to treat Yume Nomad like our own house and we did, making full use of the kitchen to boil water and warm up our pre-packed meals from the convenient marts. They offered a fully-equipped kitchen with a cooking stove, pots and pans and even complimentary coffee, tea and instant noodle. Guests can also use the fridge and must write their name and check out date on their items. The kitchen was right across the door to the living room and cafe and upon opening it, guests are immediately treated to the scent of fresh cheesecake and roasted coffee. It was simply heavenly to walk down that short hallway to the living space. There was a balcony that overlooked the quiet street below the guesthouse and was a nice spot to just sit at with a cup of hot coffee. These areas were perfectly peaceful in the morning and at night. The cheesecake was homemade and the main star of the cafe. I wanted to try it one evening but sadly it was sold out. However its freshly-brewed coffee didn't disappoint and carried a mean kick. It did its job well in keeping me awake one of the nights as we were waiting for the washing machine to be freed up and for our clothes to be done. I especially love the main entrance area as it has a map on the wall with Polaroid photos, detailing the many visitors that has stayed with Yume Nomad since its opening. The entire guesthouse was an art gallery with hand-drawn images on its doors and walls. It was like Alice in Wonderland, only much more homey. I found Yume Nomad to be a nice place to stay at in Kobe, secluded but with easy access to everything and at decent prices as well. 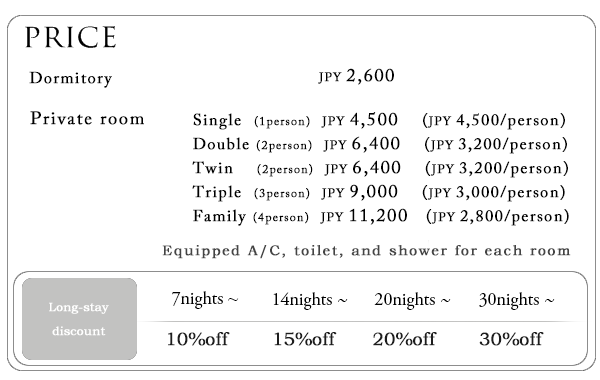 I had opted for the private family room for two nights and only paid 5,100 yen/RM160 per person. 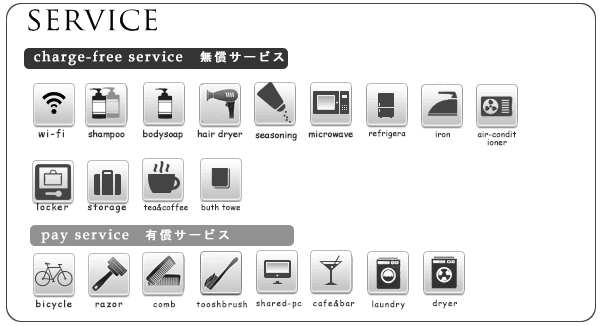 The guesthouse provides everything that you really need when staying aboard and for me that was more than enough. On the downside, they only have one washing machine and dryer for the whole place so my advice would be to plan your laundry time wisely or you will be queuing for the machine. For more information, go to their website >>> http://yumenomad.com/english/ or to make reservations, email them directly at reservation@yumenomad.com.